Dont you just hate getting mud in your home after a day in the garden. Particularly at this time of year when the ground is wet, and any digging generate piles of mud and mess. 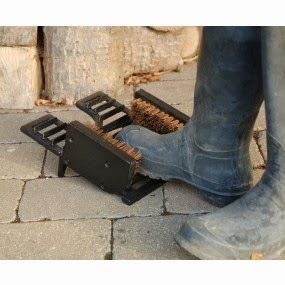 I was recently sent a very smart boot scraper from The English Lamp Post Company.This is made from cast iron and is very solid. I particularly like the brushed sides to get rid of mud on the side of your boots. In the past I have resorted to scraping mud off on the side of the step and then bending my leg to get the mud off the side. Well no longer will I need to perform strange gymnastic movements with this delightful item. Its retail price is just £29.99 which makes it pretty good value for the quality of the item too. I have no doubt that this will be at my back door for many years to come, and will no doubt help save arguments over making a mess inside - although Im sure I can manage that from time to time anyway. If you fancy one for your muddy boots be sure to check out their website.